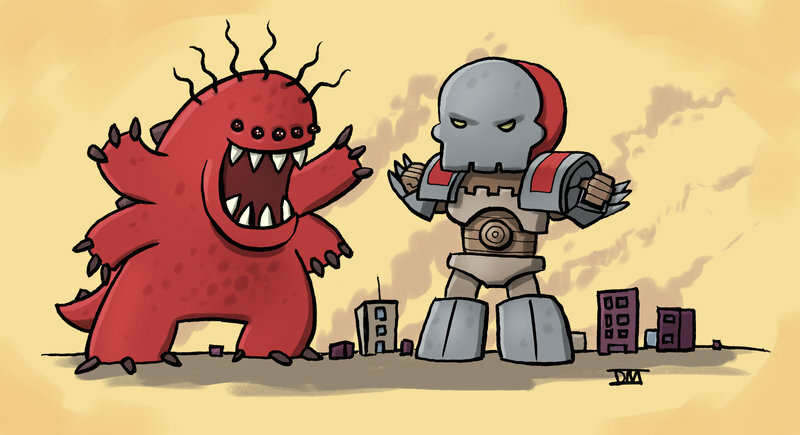 Kill All Monsters at The Source this weekend! 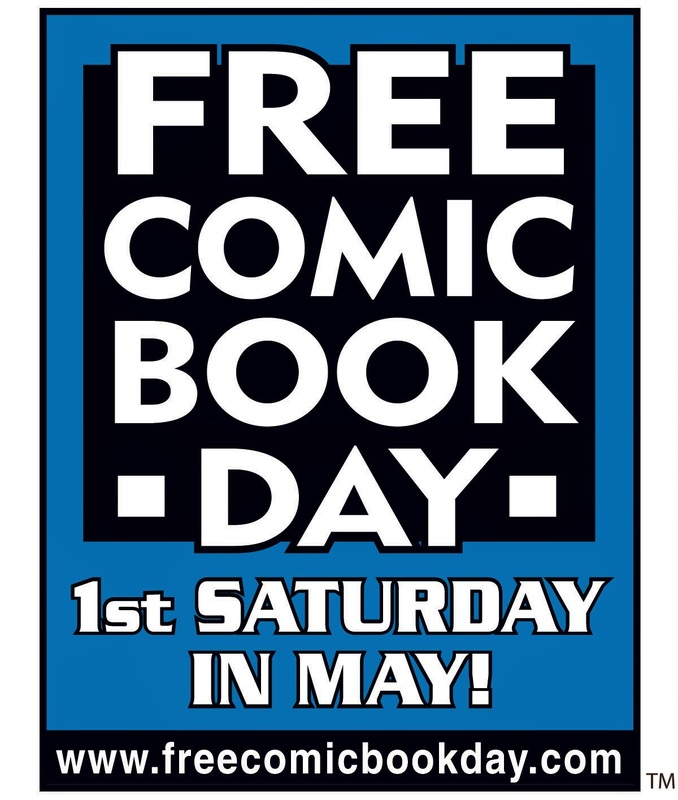 This weekend is Free Comic Book Day! As usual, I'll be spending it at The Source Comics and Games, but this year I won't just be picking up a stack of free comics and taking advantage of the store's huge sale. I'll also have a table with copies of Kill All Monsters. KAM will be for sale, but I do have some awesome prints to give away with every purchase of the book. So... Free Comic Book-Inspired Art Day, I guess? And of course I'll be happy to sign any copies that you already have for absolutely zero dollars. Whatever the situation, if you're in the area, I hope you'll come by and say hello whether you buy anything or not. My wife Diane will also be there face painting; also not for free, but super fun. She's great at superhero faces, logos, Pokemon, and pretty much anything geeky and cool. If she can find a reference for it, she can put it on your cheek and make it look amazing. 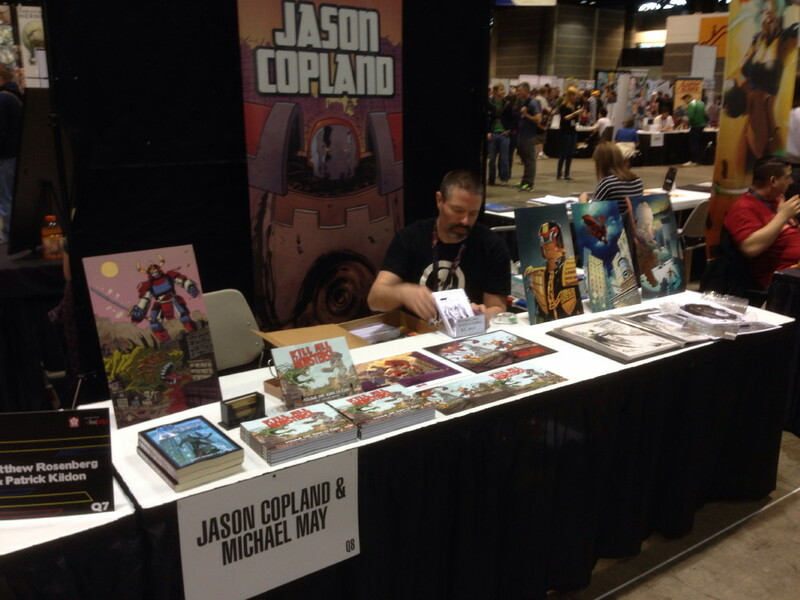 As long as I'm writing about appearances, I should quickly mention that C2E2 was a great success. I got to spend the whole weekend hanging out with Jason and a bunch of other friends, both old and new, whom I don't want to list because I'll forget someone important. 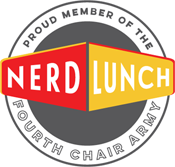 But we sold a bunch a books and talked to a lot of kaiju fans, all of whom never fail to humble me with their vastly superior knowledge of giant monsters and robots. If I talked to you last weekend, please know that I loved it and look forward doing it again as soon as possible. 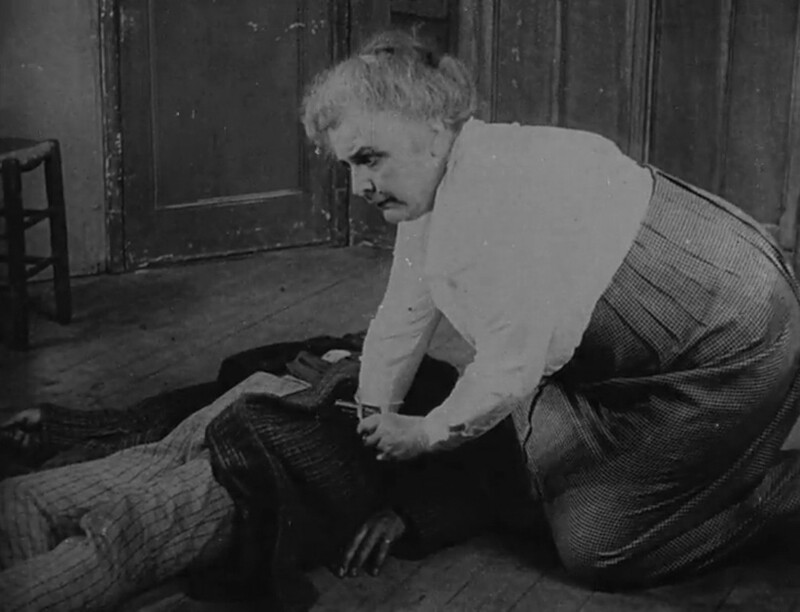 I'm making my way through Louis Feuillade's Les Vampires, one of the first movie serials. I'm not that familiar with Feuillade's work, but I love serials and silent film and the iconic image above that's most often connected with Les Vampires, so I needed to at least check it out. 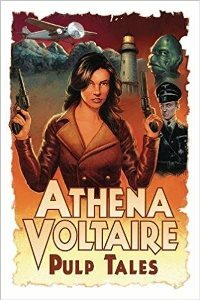 I didn't have high hopes going into this one though for a couple of reasons, biggest of which is that I couldn't make it all the way through Feuillade's other silent, serialized masterwork, Fantomas. I liked Fantomas for a few episodes, but they got repetitive, even when I staggered my viewing out to an episode a night. I grew tired of it and I expected that I would with Les Vampires as well. That repetition is connected to my second reason for being pessimistic, which is that Les Vampires isn't about vampires at all, but - like Fantomas - is about an intrepid investigator and his humorous sidekick who are looking into the affairs of master criminals. I knew before I started it that Les Vampires isn't a monster series, but the more I watch of it the more it reminds me of Fantomas, at least superficially. It has a couple of things going for it though that have a chance of pulling me through the whole series. First, the criminals have a lot more style than the titular villain of Fantomas. Not that Fantomas is without class. 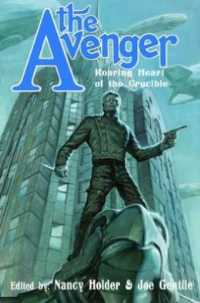 He's an intelligent, resourceful bad guy and fairly charming, though ruthless enough that I never wanted to see him get away. The criminal organization from whom Les Vampires gets its name though are all about flash with their ninja outfits and secret meetings. 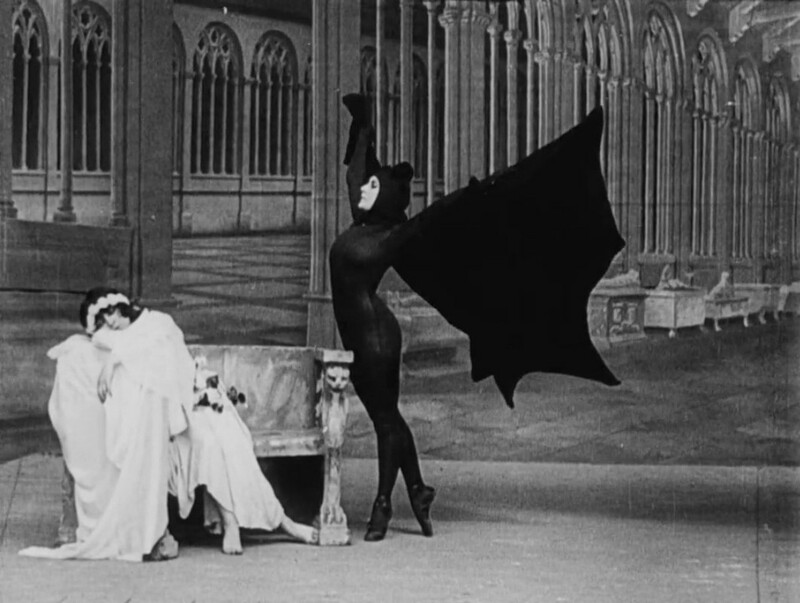 I also like how petty they are: beheading a policeman for getting too close and targeting a ballet dancer for daring to dress like a vampire bat onstage (that's her in the screenshot above). They also have an agent who's boldly named Irma Vep and I'm kind of in love with her. She reminds me a lot of a murderous Aubrey Plaza and I'll be interested in the series as long as she's in it. Women do especially well in Les Vampires, which is another thing that could keep me going. The main character - an investigative reporter - lives with his mother, who looks pretty helpless on the surface. But when she's kidnapped by the Vampires as leverage against her son, she doesn't wait around to be rescued, but figures out how to free herself. I'm only three episodes in, but if the rest of Les Vampires is as surprising as this first part, I'll happily stay on for the whole ride. 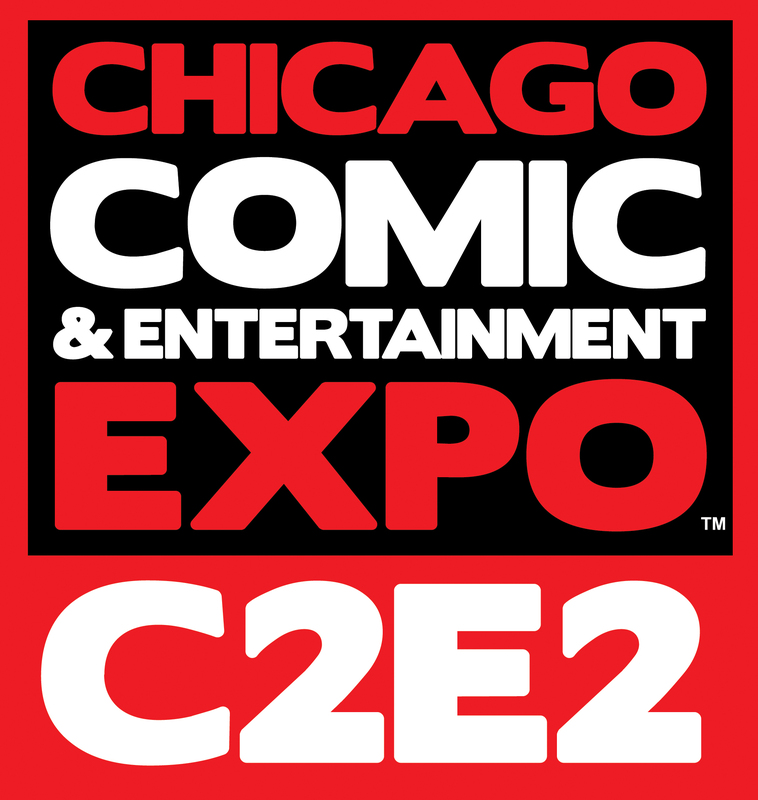 Just a quick note that Jason and I will be at C2E2 this weekend with plenty of copies of Kill All Monsters and other cool swag. Table Q-8 in Artist Alley. 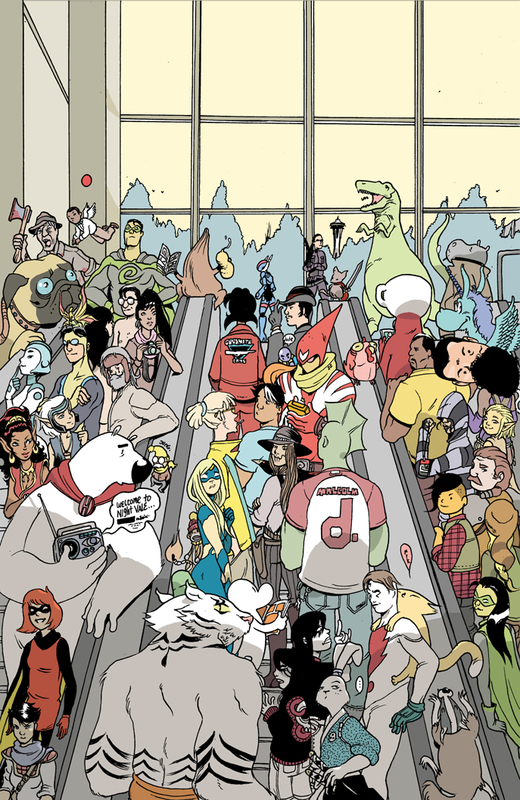 I love this drawing that Brandon Graham did for the Emerald City Comicon program book. It's all creator-owned characters from people who were at the show. It's fun to figure out who everyone is, but if you get stumped, Graham has the cheat sheet on his blog. A.Shay Hahn is a Toronto-based painter who's working on a couple of comics called Squirley Corn and Homeless G-Men for planned publication next year. 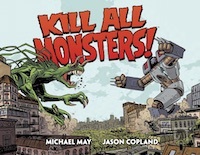 While looking at different formats for comics, he discovered Kill All Monsters and dug the landscape format, which I hope I can be pleased about without sounding like a jerk since that was all Jason's idea. 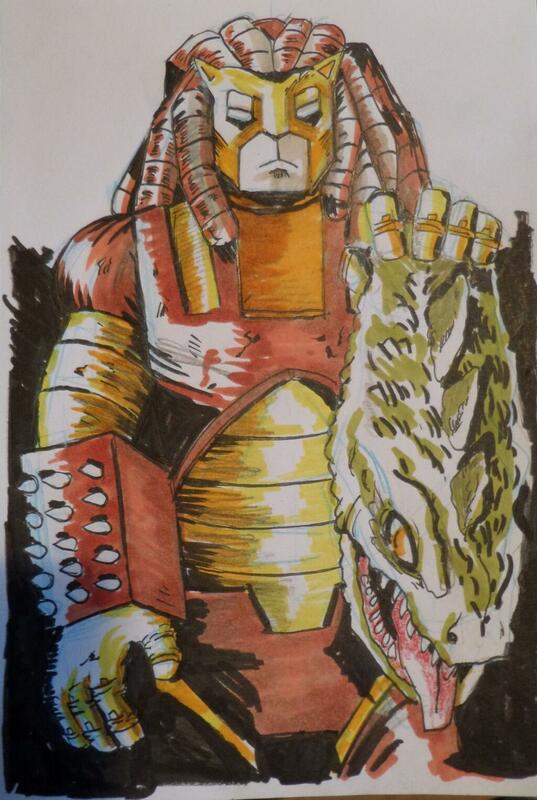 Anyway, he also created this lovely piece of the Lionbot and a former adversary. Thanks so much for sharing that, Mr. Hahn! Jason and I are thrilled that you like the book! You may remember Daniel Mead's name as the artist who made these awesome kaiju/giant robot pieces a while back featuring some of the Kill All Monsters Bots. Turns out, he's super versatile as proven by this adorable showdown between the Skullbot and a giant friend. Thanks, Daniel! Now I want Kill All Monsters plushies! 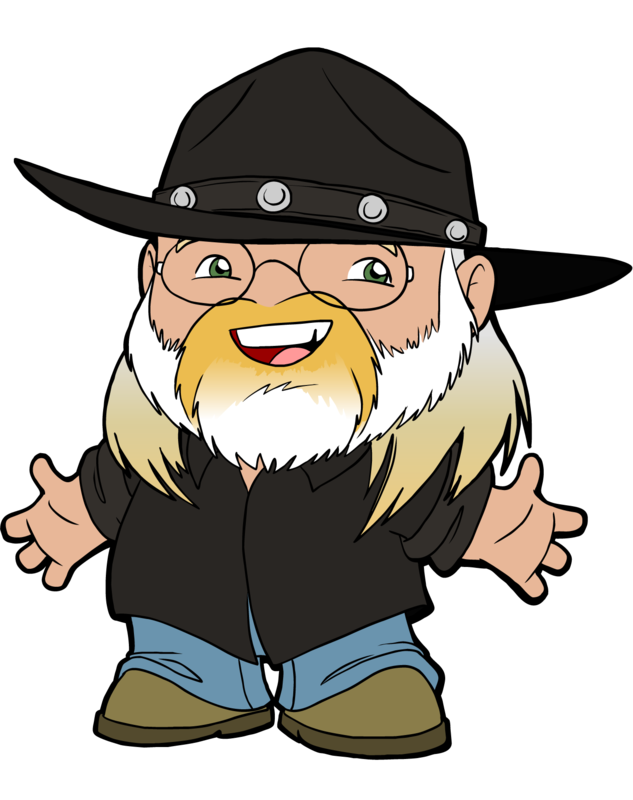 Check out Daniel's DeviantArt page for more of his great stuff. 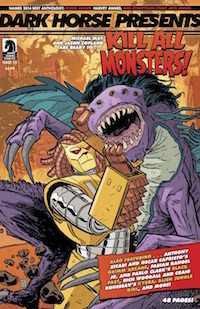 The good folks at Barnes & Noble would like for you to know that Kill All Monsters, Volume 1 and other Alterna comics are now available at their stores and website. They weren't for a while, but that's changed. Always good to have another place to buy, so thanks, Barnes & Noble! 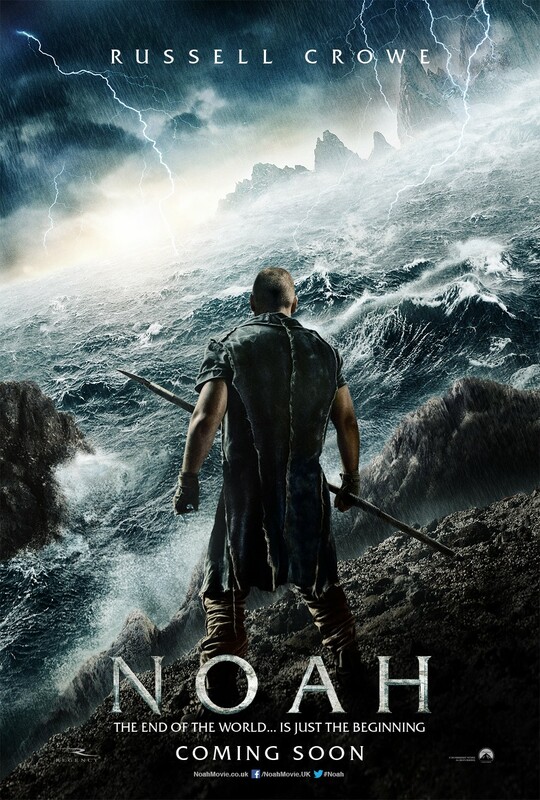 Noah is my first Darren Aronofsky film. It would’ve been The Wolverine if it had worked out for him to direct that, but it didn’t, which is too bad. As much as I enjoyed the first three quarters of James Mangold’s film, based on Noah, I really want to see what Aronofsky would’ve done with that. It’s not that I’ve intentionally been ignoring the guy, it’s just that none of his films have grabbed me enough on a conceptual level to get me to sit down with one. That changed with Noah. I expect it’s a lot of people’s first Aronofsky film. It’s based on one of the oldest, most familiar stories in the world and whatever differences folks have about how true it is, everyone knows the basic plot. And based on the $100 million it’s made so far worldwide, they’re also curious to see how Aronofsky’s interpreted it. That’s what got me into the theater. The story of Noah is a tough one to navigate, even for serious Christians. I had no problem accepting a literal interpretation as a kid, but the older I got, the more I struggled with it. Not just with questions about the logistics of fitting all of those animals into that boat, but also with the theological questions the story raises about the nature of God. I’ve had to wrestle with that stuff, so I was interested in seeing what conclusions Aronofsky came to about it as well. 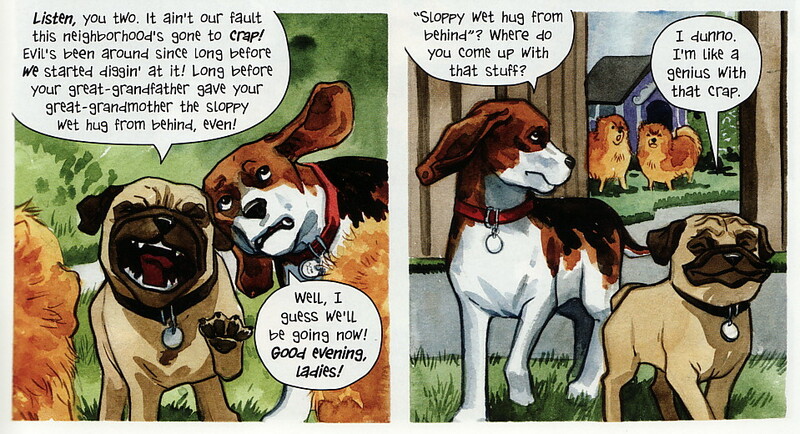 From Beasts of Burden: Hunters & Gatherers by Evan Dorkin and Jill Thompson. Everyone Hates Cephalopods: The Video! Adventureblog reader Dave Mable made this awesome montage of many of the Everyone Hates Cephalopods images I've posted over the years. And put them with the perfect song. Thanks, Dave! I haven't posted a lot of cephalopod art here lately, but that's mostly because there are other platforms better suited to that kind of thing. I've got a whole Everyone Hates Cephalopods page on Pinterest, and that theme occasionally creeps up on my Tumblr as well. If you haven't checked out either of those yet, I encourage you to do so, especially the Tumblr. I've been very active on that lately and it's full of awesomeness. A million thanks to Italian book blog Tutto Benenella Mia Testa for not only picking me to receive a Boomstick Award, but also saying very nice and encouraging things about me in the process. It couldn't come at a better time, because frankly I've been overwhelmed with work and life since about last Fall and it's been especially tough the last couple of months to balance this blog with everything else. I never intended for sporadic reviews of James Bond novels to be the only content here, but it's worked out that way lately and that makes me sad. TBMT, on the other hand, makes me happy. I also got another encouraging note recently from a different person - I'll share that tomorrow - so it's been a nice week and I'm going to use that encouragement to motivate me to post more often. Thanks for being patient.